Accepta 4452 is a high performance, hydrocarbon & fatty acid ester based multi-purpose antifoam and foam control agent. 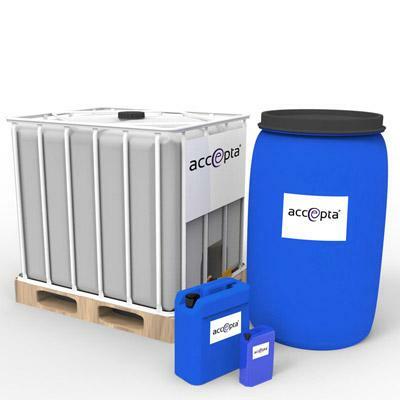 Accepta 4452 is a highly effective antifoam product which both prevents and controls foam generation. Accepta 4452 gives the same superb results over a pH range of 4 – 12, and across a wide range of industrial applications, including, paper making, textile printing, acid cleaning, adhesive manufacture, paint manufacture, plus many other uses. The actual usage of Accepta 4452 will depend on specific site conditions and so should be tested on site to determine the best dosage rate. Feed Accepta 4452 neat or as a 2 – 40% solution. Generally, the dosage rate for Accepta 4452 is likely to be between 5 and 200 ppm. For further technical assistance concerning Accepta 4452 please contact Accepta.